Friday's top-of-the-table visit to Tannadice is a chance for Hibernian to "lay down a marker," says the Championship leaders' boss Neil Lennon. Dundee United, unbeaten in 10 matches, are three points behind Hibs, who have lost just once in the league. "It's a six-pointer maybe for United," said Lennon. "If we lose the game we are still top of the league. "If we play as well as we have been recently, it's going to take a good team to stop us." 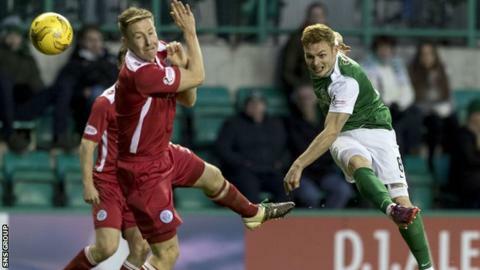 Lennon will be without influential midfielders John McGinn and Fraser Fyvie, with the former expected to be sidelined for "six to eight weeks" after ankle surgery and the latter facing the prospect of "three to four weeks" out with a groin problem. "The mentality is good, the hunger is good and they'll need to be at their best to beat United because they've been pretty strong at home," Lennon told BBC Scotland. "But it doesn't phase us. Our away form this season has been very good. "Unfortunately, we've lost two very important players so we may not function as well as we have done but we have good depth and shouldn't be too far off it." Lennon revealed that he is looking for recruits in January but dismissed reports linking him with Kris Commons. The pair worked together at Celtic where the 33-year-old playmaker is currently out of the first-team picture, having not made a single appearance since April. "He's a top player and I know all about Kris," said Lennon. "I can't help speculation but there have been no enquiries from us. "It's not the forward areas that we need to strengthen at the moment. With my central midfield so depleted, that's an area we obviously need to look at. "We have made approaches to one or two clubs and we're waiting to hear back."